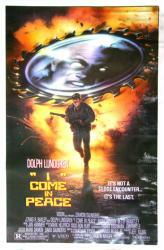 This is an original, single-sided, rolled, 27" X 41" theatrical one-sheet movie poster for the 1990 action sci-fi thriller I Come In Peace. The poster remains in POOR to FAIR condition with some creasing and rippling in its surface, and water damage on the right side. The poster has water stains on its backside and white-ish marks on the poster's front side where the color has bled away. Please check our image for a visual representation of the water damage.